If you have purchased a skylight before, you would know that there are two main types of skylights available in the marketplace – vented and fixed. True to its name, the fixed skylight cannot be operated and are primarily installed to provide extra illumination. Conversely, the vented skylight can be opened manually or via remote. If you plan to install remote controlled skylight, you must be willing to spend a little extra. When buying an electric skylight, you must remember that these skylights have several sophisticated parts that can get damaged due to regular use. Residential users who are looking for an alternative to traditional skylight, can consider installing Tabular Daylighting Device or TTD. These weatherproof devices capture sunlight and channel it to the rooms using reflective metal tubing. At the end of the tube is a special lens that spreads the light through the room in a white glow. Earlier most skylights were a simple pane of glass that was sandwiched between metal frames. Today, you have a gamut of variables to choose from such as material, coating, insulation, UV-radiation and several other variables. You can also select the type of glass you want to install. If you live in a hurricane prone area, you can install impact glass. These glasses are widely used in impact resistant doors and windows. Just as storm windows and doors protect your property from strong windows and projectiles, skylights made using impact glass protect your home from strong windows during hurricanes. Since impact doors or hurricane doors offer innumerable benefits, most homeowners prefer using them when taking up a door replacements project. Impact glass skylights are usually rectangular and flat shaped structures that lend themselves to any number of placements on your roof. Before purchasing a skylight, you must consider the structure of the roof. You could take a peek into the attic to get details of the frame used to construct the roof. You should also check the difference between the rafters. Most conventional skylights are available in sizes that easily fit between the rafters of the roof with standard framing of 16 or 24 inches. It is not impossible to fix a larger skylight, but to do this; you will have to get help from a professional. To fix a larger skylight the rafters must be headed off, cut and doubled up, which is a job best done by professionals. Installing a moderate sized skylight is not easy, as it can take residential users several days to complete installation. However, there are several skylight systems available in the marketplace that can be installed in a couple of hours. If you have prior experience in installing skylights, you can easily install these modern systems without any professional help. These modern skylights don’t require any change in framing and you don’t have to carry out any major wall or ceiling repairs. 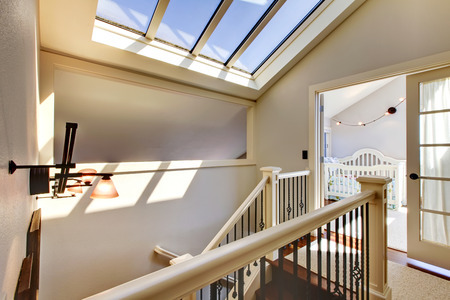 The costs of skylights vary widely, depending on the varieties you choose. When considering the cost of the skylight, you must not only consider the product cost and installation cost, but also take into account the impact of skylight on your cooling and heating energy bills. Avoid buying cheap skylights because these skylights are not well insulated which can lead to energy loss. In summers, inexpensive skylights will allow more heat to enter your home which can increase the cooling cost. During winters, it will let heat escape from the room which will increase the heating costs. Therefore, it is important that you check the Energy Star certification before buying a product. Low energy star rating products may be inexpensive when compared to high energy star rating products, but these products can increase your monthly electric bills. Today, most reputed manufacturers make products that exceed the minimum energy performance requirements.